Q: According to reports, Stephen Jacobi, Executive Director of the New Zealand China Council, recently stated that the Belt and Road Initiative will help boost New Zealand's economic development and deepen New Zealand-China relations. How do you view the prospect of New Zealand's engagement in the Belt and Road cooperation? A: Having followed the principle of consultation and cooperation for shared benefits since its inception, the Belt and Road Initiative (BRI) is welcomed and endorsed by the vast majority of the international community. It is joined by a growing number of countries and international organizations and has yielded concrete outcomes beneficial to all parties. All like-minded countries are welcome to participate in the BRI cooperation. Following the principle of consultation and cooperation for shared benefits and the principle of openness, inclusiveness and win-win cooperation, the Chinese side stands ready to advance mutually beneficial cooperation with other parties in an in-depth manner. Q: It has been reported that on February 27, Nigeria's Independent National Electoral Commission announced that Muhammadu Buhari, incumbent president and presidential candidate of the All Progressive Congress party, won the general election with 55.6% of the vote. Does China have any comment? A: We noted that Nigeria's Independent National Electoral Commission has declared the official result for the general election. We'd like to extend our congratulations to Mr. Muhammadu Buhari on his re-election as president of Nigeria. Nigeria is China's important strategic cooperative partner in Africa. China always attaches great importance to growing its strategic partnership with Nigeria. We stand ready to work with the new administration to step up exchange and cooperation in various areas to bring more benefits to our peoples. Q: On Monday at the meeting of the United Nations Human Rights Council in Geneva, both Turkey and Britain raised concerns on the Chinese government's policies in Xinjiang. What is your response? A: We noted that certain people in Turkey and the UK have been making irresponsible and bad remarks on the issue of Xinjiang recently in disregard of facts, which the Chinese side firmly opposes. In fact, those certain countries you mentioned know very well that the violent, terrorist and separatist forces of East Turkistan as represented by the East Turkistan Islamic Movement (ETIM) have posed the most direct and serious threats to the safety of people in Xinjiang Uyghur Autonomous Region over the years. Some people in Xinjiang have been influenced and blinded by extremist ideology and isolated themselves from their families and the society. They don't have any decent jobs and lack working skills, thus become quite susceptible to terrorist, violent and extremist forces. The measures taken by the government of the Xinjiang Uyghur Autonomous Region aim to help them master skills and return to the society and their families. By learning the knowledge of national laws, vocational skills and common language, they will be able to conduct normal production and have a normal life. By doing so, they won't further fall victim to terrorists and separatist forces or even become perpetrators. These preventive measures are proven effective. In fact, these measures have achieved visible outcomes. 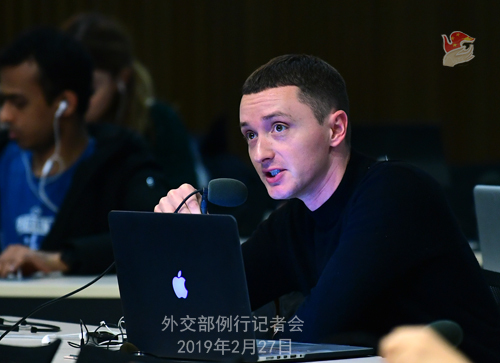 The Chairman and other officials of the Xinjiang Uyghur Autonomous Region have briefed the international community on the relevant situation for many times. The most notable effect is that in the past 20 months or so, no violent terrorist attacks have occurred that cause casualties of innocent citizens. I believe any unbiased person will give credit for such achievement. Turkey itself has been long plagued by terrorism and separatist forces, but certain people in Turkey have ignored basic facts, kept smearing China's efforts to combat terrorism and eradicate extremists, vilify the government of China's Xinjiang Uyghur Autonomous Region for the measures it has taken, which is clearly ill-intended. 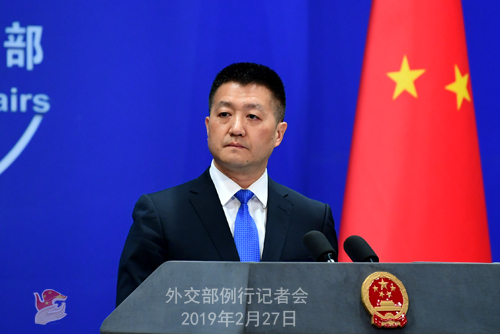 We urge the certain countries you just mentioned to look at China's measures to combat terrorism and eradicate extremists in an objective way, stop making erroneous remarks and uphold the general picture of the international counter-terrorism cooperation with concrete actions. Q: In wake of intrusion into its airspace and violations of its territorial sovereignty by Indian air force yesterday, Pakistan has called upon the international community to condemn Indian aggression which has violated the UN Charter, support de-escalation, urge India to end its suppression in Indian-occupied Kashmir, and promote peace and stability in the region through engaging in dialogue. It also said that onus of escalation is with India. What is China's comment? A: Actually I answered a relevant question yesterday and made clear the Chinese side's principled position. We have noted recent developments as well as the positions made clear by India and Pakistan. As I said yesterday, India and Pakistan are both important countries in South Asia. We hope the two sides will bear in mind the peace and stability in the region, exercise restraint, step up dialogue and properly resolve relevant issue, so as to safeguard the fundamental interests of their countries, maintain peace and stability in the region and refrain from actions that might lead to further escalation of tensions. Q: Just have a follow-up question on Pakistan and India. Pakistan just said that it has shot down two Indian military planes today in Kashmir. As a neighboring country, is China concerned about this move by Pakistan? A: Like I said when taking the previous question raised by APP, regarding the recent developments which have drawn the attention of the international community, China's position is clear-cut. Our concern is that India and Pakistan, two important countries in South Asia, will maintain good neighborliness and that South Asia will maintain peace and stability. So we hope both sides could exercise restraint, take measures conducive to promoting dialogue and work actively to contribute to the lasting peace and stability in South Asia. Q: The International Court of Justice has issued an advisory opinion on the Chagos Archipelago case on February 25. It said that the separation of the Chagos Archipelago from Mauritius in 1965 is against international law. The United Kingdom has an obligation to bring to an end to its administration of the Chagos Archipelago as rapidly as possible. All member States must cooperate with the United Nations General Assembly to complete the decolonization of Mauritius. What is your comment? A: The Chinese government welcomes the advisory opinion of the ICJ on the Chagos Archipelago case which upholds the UN decolonization process, champions the right to self-determination and other relevant norms of international law, and supports Mauritius' legitimate quest. 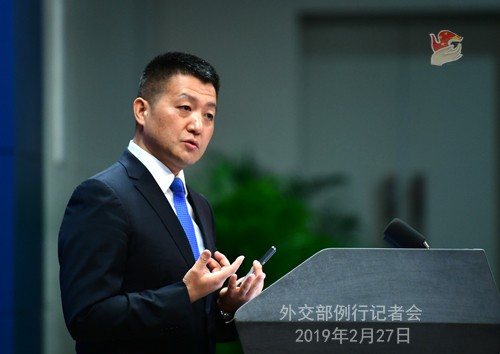 China has taken an active part in the relevant process and expressed its firm support to the decolonization process championed by the United Nations in its written statement to the ICJ. Q: It is reported that the US and the DPRK leaders may discuss the declaration on ending the Korean War during their meeting. China was part of the Korean War. What is China's comment on an end-of-war declaration? A: As we said yesterday, we hope the upcoming DPRK-US summit will build on what has been achieved and lead to more positive outcomes. China supports an early end to the state of war on the Korean Peninsula. We proposed and still believe that the effective way to resolve the Peninsula issue is to follow the dual-track approach, which is to promote denuclearization and the establishment of a peace mechanism on the Peninsula in parallel. We support all efforts that are conducive to this process and stand ready to play our role in this regard.